Virtually all of automotive manufacturing is located in Ontario. Utility costs (electricity and natural gas usage) are a material cost to assembly operations and continuous efforts are made to seek out efficiencies and reduce energy consumption. The Ontario auto sector consumes large amounts of electricity annually in their manufacturing operations primarily to drive automation, which drives increased productivity. Better alignment of delivered electricity costs is needed within Ontario and with competing automotive jurisdictions. The Ontario government in collaboration with automotive manufacturers must explore mechanisms similar to that afforded to Northern industries and in the U.S., resources through the cap and trade program revenues, continued support for energy conversation projects and/or implement reduction in all rates until such time as competing jurisdictions have similar programs in place. 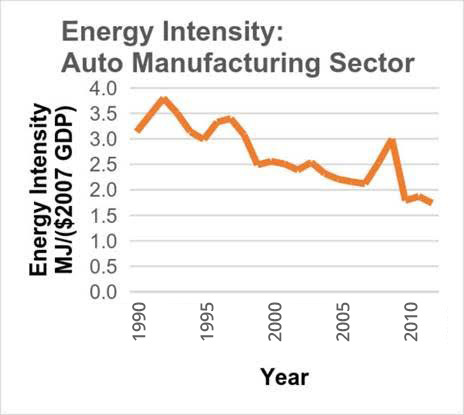 Focused effort is essential to ensure that offsets or direct supports and rate reductions are in place help mitigate the significant increase in operational costs that undermine the competitiveness of auto assembly and manufacturing plants in Ontario. The automotive industry utilizes advanced smart manufacturing processes and has undergone immense technological change to become more efficient and productive in order to remain competitive. For more than 30 years, CVMA member companies have proactively introduced sophisticated, award winning energy conservation programs and control measures to reduce electricity usage and costs. Examples of energy efficiency projects have included: more efficient lighting retrofits (LED), ventilation optimization, process optimization, and aggressively shutting down equipment and processes when not needed. Opportunities to further reduce electricity consumption are being pursued on a continual basis. Electricity rates in Ontario are not competitive with other industrial sectors in the province and with competing jurisdictions in the U.S. Ontario’s automotive plants pay the highest electricity rates compare to the U.S. states, as high as 2.5 times for assembly plants, and 2.9 times more for components plants. Uncompetitive electricity rates are further exacerbated by Ontario’s Cap & Trade program and the lack of certainty beyond 2020. This places an additional cost on vehicle manufacturing plants operating in Canada (Ontario), not incurred elsewhere, negatively impacting the competitiveness of the industry. 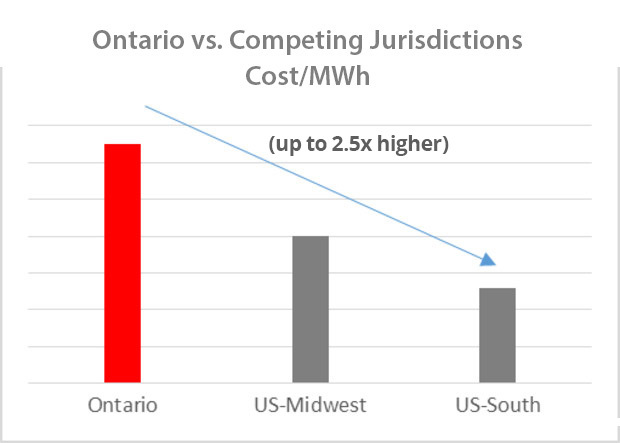 While innovation and production improvements can offset some operational costs, the more competitive energy rates in other U.S. jurisdictions create a significant disincentive to invest in Ontario. To maximize plant utilization, auto plants operate on two to three shifts a day, providing a steady based load demand which is good for the electricity system. However, this negates the possibility of shifting electricity demand to off-peak hours as a means of reducing cost both in terms of the Global Adjustment Factor and actual delivered cost to the plant. In fact, auto plants are penalized by high electricity rates because of their steady electricity demand.